Just wondering what fellow iPhone 8 owners are thinking now they’ve had them for (around) 2 months. Happy? Wish you’d bought an X instead? Any pleasant surprises or unexpected downsides? I guess I go first and I am happy. It’s a big upgrade from my 6 and most of the downsides that people (and specifically some podcasters) have complained about just aren’t an issue to me. The obvious ones are headphone jack (I just leave the dongle attached to the plug of my headphones or use airpods) and the fake home button (no it doesn’t feel like a button but it gives feedback and it works). I guess the pleasant surprise is that Bluetooth seems more robust. I play music via Bluetooth to a Bose speaker in my house. With my iPhone 6 there seemed to be a lot of dropouts if I was using my iPad at the same time. Maybe it’s an iOS fix or maybe it’s a better Bluetooth chip but it’s much better. The only downside is that I’ve dropped this phone even more than I dropped the iPhone 6. Maybe it’s the phone or maybe I’m getting stupider! The surprise is that even though I don’t use a case is that it’s still in one piece. Earlier today I dropped it about 3 feet onto a hard kitchen floor and it didn’t get a single mark - partly better glass on the phone and partly dumb good luck!!! I viewed the iPhone X as something of a 1st gen device and was happy for others to test it out and live with the year 1 quirks. I still hold that view. Interested to see what others think of their 8’s. zinedine, AllanRosen and kcox52692 like this. Still stand by my decision to get the 8+. I’ve seen the X and I agree that whilst it is a beautiful device, I’d rather wait. I don't know... maybe I am in the minority, but I am underwhelmed. I came from a 6S that was still working great and now I wish I hadn't spent the extra $ on this upgrade. I detect no performance increase, and that was my primary incentive for switching. If anything, I have had a few more glitches and weird slow downs on this phone than I had on my 6S. Weird issues with ringtones reverberating, or the wrong tone playing for notifications. Worse though is strange drops of LTE data connectivity where suddenly I have "No internet Connection" when trying to browse on LTE. I am considering setting this phone up as new and NOT restoring a backup (thus far I have twice restored a back up - once from my 6S, and then again from this 8). I wish I had either gone up to the 8+ for a bigger sense of change or stayed with my 6s one more year. 2ndHalfCor, zinedine and kcox52692 like this. Love my 8 plus glad I went with it, still find myself at the Best Buy or Apple store playing with the X though . One month in for me and I love my 8 more and more every day. I come from the 4" screen of the SE so this 8 screen is just right for me. I almost never take pictures of people so all those options that the Plus have would go unused by me. The single best thing about the 8 is simply the processor. As an impatient person, having everything open right up is a real plus. The ability to use a fast charger is a plus too. I have an Anker fast charger and cable, and love how fast I can charge up. I have absolutely no interest in ever using the wireless option. Photography is my hobby. I can't believe the quality of the pictures this phone takes. The HDR takes care of contrasty scenes better than my SLR. Can you link to the Anker fast charger? I purchased an 8+ (won’t be using it until after Christmas) but I am looking ahead for accessories. I looked on Amazon but not getting good results. Could be my current connection as I’m up hunting at the moment. I have upgraded every year since buying the 6plus when it released. I went from the plus to a 6s then had the 7, now the 8. Honestly I don’t know if the 8 is any faster because I cracked the screen on my ip7 almost immediately. I used it for a little while and went to get it fixed but by then the camera lens was cracked too so the repair without AppleCare was going to be more. So I paid a guy to come out and fix the screen for around $100. It was fine but as time went by I realized what a mistake I made because the screen was pure garbage, wouldn’t scroll in a fluid manor and I couldn’t see the screen with my polarized ray bans on. So by this time Samsung gave me a galaxy s8 for free so I used it until the ip8 dropped. I have to say that I love my ip8. I like the wireless charging a lot. Also I use my MacBook pro charger to charge my 8 and it charges very fast so that is nice in a time crunch. If I hadn’t cracked my ip7 and done all that I may have kept that one, it was really nice. I love my ip8 and go without a case or screen protector, but I bought AppleCare + this time. My verdict is a success. I don’t know why people expect a new redesigned phone every year. These companies need to make money or they won’t exist, why is that so hard to understand? My iPhone 8 is basically a refined iPhone 6 and I am cool with that. Yes, all the new iPhones - 8, 8+ and X can use fast chargers. I'd describe my iPhone 8 as "unspectacularly good". It's better in every way from my previous 5s, the hardware is beautiful and fast, and the software well polished and easy to use. But my gripes with iOS are still mostly present (I tend to prefer Android on phones, iOS on tablets). It's exactly what I expected...a better faster traditional iPhone. 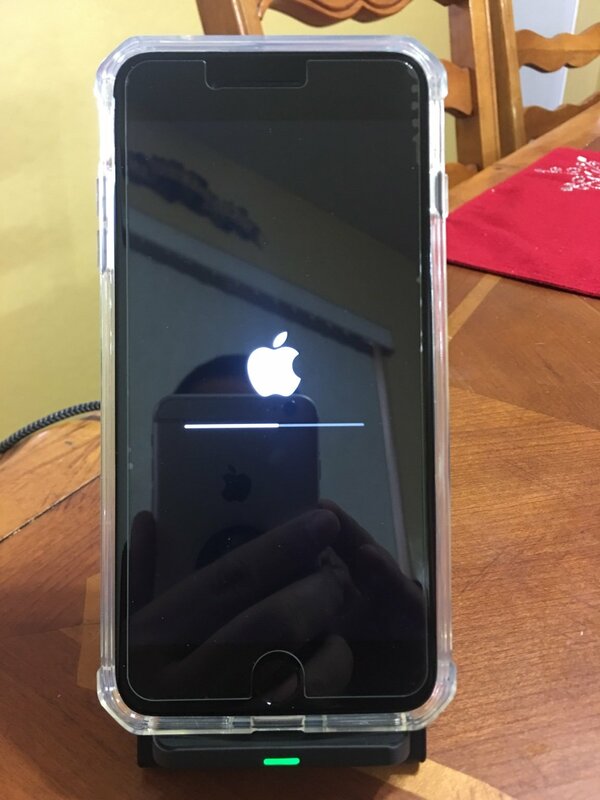 I came from a 6s plus, and hemmed and hawwed a bit about whether I wanted to downsize. I did, to the 8, and I'm very happy with that decision. Fits in pocket better, just took a week or so to get used to the 'tiny' size. It's quick, and battery life has been awesome. I don't do tunes on my phone, so the headphone connection is not a problem. Zero issues so far. I'm still using a 6s. The 8 looks good but I've heard of battery issues with the battery expanding and ruining the phone. It's probably just a few isolated cases but I'll wait and see. Meanwhile the 7 looks pretty good too. I don't use the headphone jack that much anyway. It'd have to be a 128gb though as that's what my 6s is. If there were battery issues it would have blown up into a media frenzy as any little Apple related possible mis-step does these days and there hasn’t been such an outcry. If those reports are real (and they might not be) it could easily just be bad batteries which could happen to any device of any brand at any time. If you live your life based on what might happen then you’ll miss out on a lot. kcox52692 and AllanRosen like this. With the exception of updating it to the latest iOS version, my iPhone 8 has been kept in its packaging ever since I got my iPhone X. You know what, I may swap SIM cards later this evening and use my iPhone 8 tomorrow in lieu of my iPhone X.
kcox52692 and zinedine like this. My plan was to get an 8+ and skip the X. Then I saw the X and changed my plan. This thing is AWESOME. Got iPhone 8 from my employer -- wouldn't have paid its full price myself, obviously, since it's, what, 1000 USD. Anyhow, have not noticed any real wolrd performance improvement over iPhone SE. Apps do not really work any quicker, since they already work quickly on the SE. And where there is lag in the iOS UI on the SE, there is lag also on the 8. So I am puzzled what that A11 chip is actually buying. It seems to me the phones perform more or less the same. Another thing I have noticed is how slow the LTE is compared to the latest bunch of Samsung phones. I gather Apple is a generation behind here with their sub-gigabit LTE modems from Intel and Qualcomm. Unfortunately, the LTE pings -- also slower here -- are what affect real world user experience more than the processor, and it is exactly on this score that Apple trails the competition. Oh well. Marketing-driven design choices always result in a poorer user experience, and it is the chipset and benchmark bandwagon that dictates Apple's design philosophy nowadays. The screen is better than the SE's -- obviously -- since the latter which features an iPhone-5-era panel. The physical design, though, leaves too much bevel around the screen; nor is it an improvement over the SE which sits better in the hand and offers a superior grip. Here, again, Samsung is also ahead. Touch ID, at least, is more reliable than on the SE, but battery life is not. In corollary, I am quite baffled why the iPhone 8 is not all that much better a device than the aging SE. In fact, the SE is now an excellent value for what it offers, and I would recommend it over the 8 if the screen size is not an issue, and rather spend the saved hundreds of dollars on other things than a new phone. Got the 8 Plus on launch day and love the phone. Only thing I wish is that it was lighter. It's heavy compared to my iPhone X. Otherwise it's a fantastic phone. My iPhone is updating. Then I should have the iCloud backup automatically. First iPhone upgrade so let’s hope it’s smooth. So it was smooth, albeit a little lengthy due to the OS upgrade. All my apps are still downloading and that’s going on 3-4 hours. Internet is bogged down due to two iPhone and three iPads Minis updating. What iPhone did you upgrade from? I had the same dust problem. And yes, I’m ok with the screen like that. It doesn’t bother me. I will probably get a new screen protector in a year or two. It’s working well.